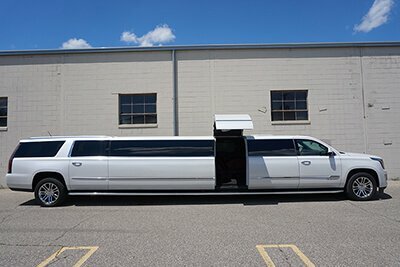 The beautiful thing about all of our vehicles at Limos Lansing is that they are the cream of the crop in the industry. You will not find finer vehicles anywhere. Riding in any of them will make you feel like royalty. The features we have installed will take your event and increase the fun and excitement level to a degree that you did not think was possible. We take your safety very seriously so we have certified mechanics on staff that inspect and maintain our vehicles on a very regular basis. 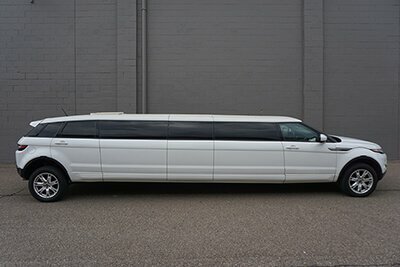 Below are some photos of our amazing fleet of limousines and limousine buses. Do you see one you would like to book? If you have questions or concerns, our friendly customer service agents are ready and willing to serve you 24 hours a day, 7 days a week, and 365 days a year. 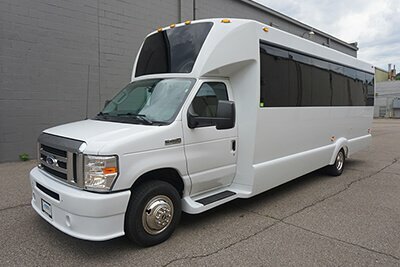 They will be able to fit you and your group to the perfect limo bus for event. Just give us a call, it will be our pleasure to serve you! 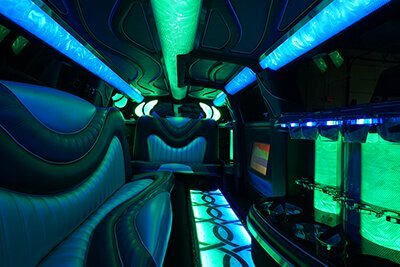 This limo has custom seats, lights, and more! 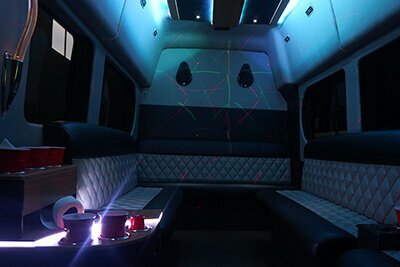 Our 12 passenger Range Rover limousine is unlike any vehicle you've ever seen! The jet doors are unique on their own, but inside you'll also find exciting disco lights in the ceiling and floor, as well as gorgeous LED lighting around the built in bar, where you'll also find ice filled coolers. The sound system on board this limousine is stellar and will not disappoint. This limousine is great for anything! 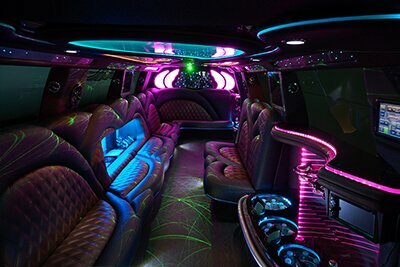 This gorgeous limo has all the features you need for a night out! 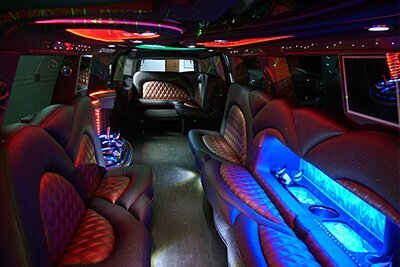 The interior of this classic limo is fantastic with leather seating and exotic hardwood floors, colorful mood lighting and accent lights, and bar areas with gorgeous granite counter tops and coolers for your drinks! This vehicle is also home to a custom sound system that provides unbelievably clear audio for movies or music whether you bring some CDs or your iPod! There's also a TV and DVD player, of course! 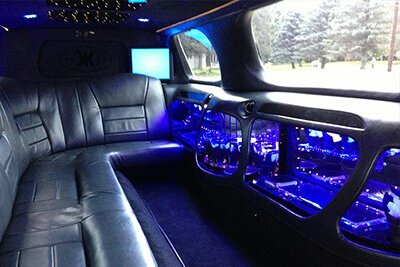 This 20 passenger Escalade limousine is very roomy. This limousine is Bluetooth capable for your convenience! Our jet doored Escalade SUV limousine for up to 20 passengers is our largest limousine option and it's a fantastic vehicle! 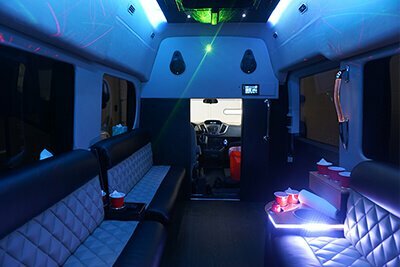 The interior offers spacious and comfortable leather seats, laser, disco, and strobe lighting effects for color and fun, a large built-in beverage area with cooler, a booming stereo system, TV, DVD player, CD player, iPod hookup, and much more! 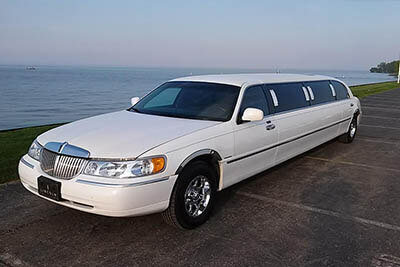 This limousine is incredible and will make the best mode of transportation for any event! You'd never guess that this white van with tinted windows holds a luxurious limousine interior! The state-of-the-art sound system in this vehicle is unbelievable! 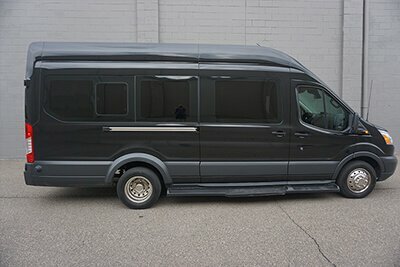 Our limousine van is a unique take on a limousine for smaller groups of up to 10 passengers. The inside of this van is absolutely amazing; plush leather seating surround the van's perimeter and you'll find high-quality hardwood flooring throughout and let's not forget the bar areas with granite counter tops and coolers! CD and iPod hook ups are available so you can enjoy the custom sound system in any way you choose! 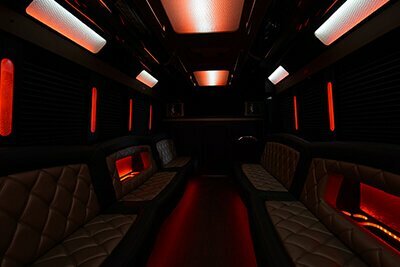 Colorful accent lighting throughout and dance pole give this limo bus a night club feel! With room for up to 28, this bus offers a comfortable amount of room without losing it's intimate feel! Our 28 passenger limo bus is our most intimately sized limo bus, but is still roomy and the supple leather seats are the ultimate in comfort. The exotic hardwood floors, dance pole, colorful LED lighting and top-quality sound system all work together to give this a night club feel. 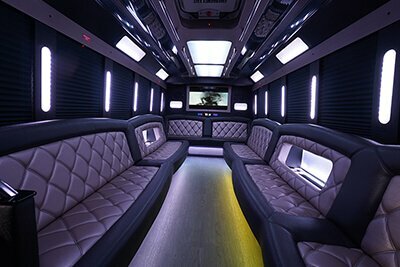 You'll love celebrating on this luxurious limo bus whether you're watching a movie on one of the flat screens, listening to your favorite song on your iPod, dancing the night away, or enjoying a drink at the bar! Our 30 passenger buses each have a unique, stylish, comfortable interior! 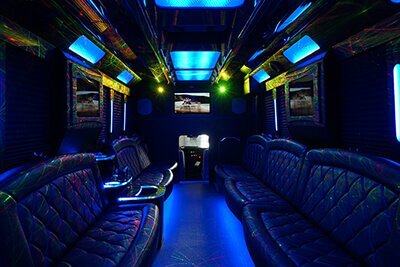 You'll enjoy the roomy interior of these amazing limo buses! 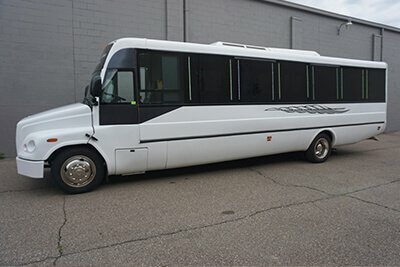 Our 30 passenger limo buses have the best in luxury features, just like you'd expect from a Limos Lansing vehicle. 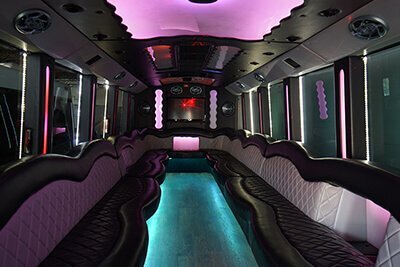 The inside of these buses feature high quality leather seating, exotic hardwood floors, multiple flat screen TVs, custom sound system, and dance pole. The bar areas have gorgeous granite counter tops and coolers. But what really makes this bus unique is the design and lighting - see for yourself in the photos below! 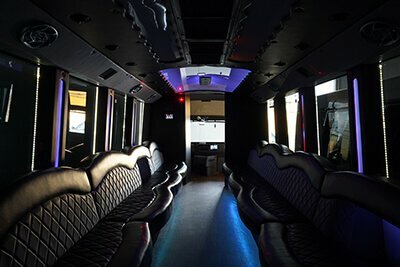 Fund raisers, corporate events, and any large party are a great fit for this limo bus! 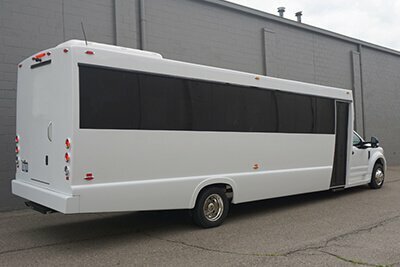 One of our larger buses, this vehicle offers a ton of room! What we love about our 34 passenger bus is that it's luxury and style on a bigger level! 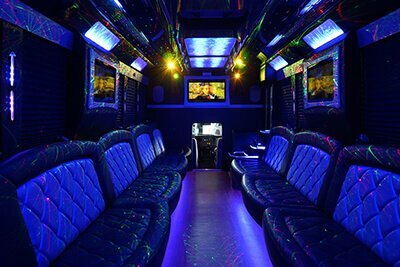 This bus has multiple flat screen TVs, hardwood flooring, leather limo-style seats, and an out of this world sound system! The colorful lighting on this bus give it a true night club feel. 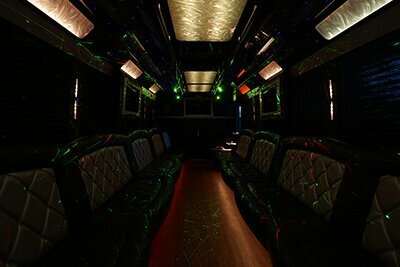 This bus also features a dance pole and multiple bar areas with gorgeous granite counter tops! Excess luxury is within this huge limo bus! This is our largest vehicle! Our largest bus is our 35 passenger limo bus! This giant luxury bus has plush leather seating for up to 35 passengers! 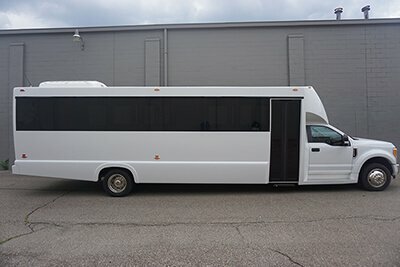 Hardwood flooring, dance pole, and bar areas in this spacious bus will make you forget you're in a vehicle! The flat screen TVs, and colorful lighting allow you to set any mood you'd like. This bus even has a stage area!!! True luxury awaits you in this amazing bus!